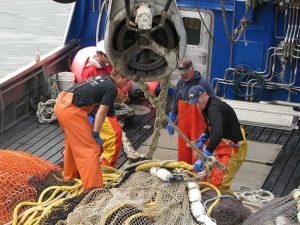 These loans have been structured after a great deal of feedback from local commercial fishermen, especially those associated with the halibut and sablefish industries. While traditional commercial loans require fixed payments, much like a car or home loan, Local Fish Fund has developed a strategy that uses “revenue participation” or repayment based on a percentage of the catch rather than a fixed structure. Because quotas and prices can vary wildly from one season to the next, this financing strategy spreads the risk between the borrower and the lender. The flexible approach also allows fishers to repay their loans in what is often considered a volatile industry. This is truly a cooperative endeavor. The loan fund was set up by the Alaska Sustainable Fisheries Trust, and capitalized by The Nature Conservancy, Craft3, the Rasmuson Foundation, Catch Together, Oak Foundation, and the National Fish and Wildlife Foundation. The Fund has been initially capitalized by Catch Together and the Rasmuson Foundation in the amount of $1.5 million. The organization is currently focusing efforts on loans in Southeast Alaska. The program will strive to increase marine stewardship and leadership by collecting scientific data as well as investing in outreach and conservation education.